Mercedes wants to expand the Smart brand beyond the ForTwo minicar. FRANKFURT -- Mercedes-Benz is developing a three-seat sports car for Smart. The radical new sports car forms part of an extended range of new Smart models planned for introduction by the middle of the next decade, including a more conventional four-seat car to be produced in cooperation with Renault SA. Mercedes is reacting to increased competition from Toyota Motor Corp. in the form of the iQ minicar and the impending arrival of similar urban-based offerings from premium-brand rivals Audi AG and BMW AG. The Smart sports car's three-seat interior draws heavily on that used by McLaren in its mold-breaking Formula One supercar, sitting the driver's seat centrally up front with a pair of passenger seats set farther back on either side of the cabin toward the rear -- an arrangement made possible by the retention of the rear-engine platform design used by today's Smart ForTwo. Mercedes-Benz's plans call for the unusual three-seat layout to be used in a replacement for the coupe and roadster pairing axed from Smart's lineup in 2005 after a run of 43,091 cars. 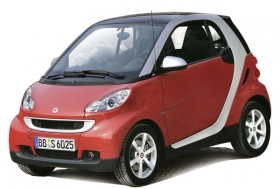 The low slung three-seat model was conceived as a sportier alternative to Smart's upright second-generation ForTwo, with roof inside for up to three. Nothing's official at this stage, but Mercedes-Benz insiders suggest that the new car could take the name ForThree and arrive in showrooms by 2014 as part of plans to extend the Smart lineup into a complete range of models. Mercedes-Benz's three-seat interior incorporates a number of innovations aimed at solving the inherent problems in such a layout, including the long stretch upon entering and exiting the cabin. Among them is a swiveling seat base as well as a transverse runner within the floor that allows the driver's seat to be adjusted out towards the door. Plans for the car were uncovered European patent-application sketches obtained by Automotive News Europe sister publication AutoWeek. The patent application sketches also reveal a complex seat belt arrangement for the driver and the placement of airbags. The three-seat interior is housed within a new interpretation of Smart's existing Tridion steel safety cell, with sturdy longitudinal and transverse members aimed at providing controlled deformation and added crash protection. Although the patent applications do not make mention of the new car's proposed mechanical package, Mercedes is well advanced on a new lineup of modular three-cylinder gasoline and diesel engines as large as 1.4 liters. Mercedes also is developing an electric-drive option for the ForTwo using a 31-kilowatt motor and a lithium-ion battery pack. Also in the pipeline is a new seven-speed dual-clutch transmission. As with the new three-cylinder engines, the transmission is planned to make an appearance in the third-generation A class due out in 2011, before making its way into other Mercedes-Benz models, including those from Smart.